Iran’s Supreme Leader blasts the United States for imposing new sanctions over his country's ballistic missile tests. Iran’s Supreme Leader, Ayatollah Ali Khamenei, on Sunday blasted the United States and claimed that Washington has continued its animosity toward Tehran, despite a friendly message by President Barack Obama marking Persian New Year, The Associated Press (AP) reported. “From one hand they send a New Year message and on the other hand they have kept economic sanctions,” against Iran. 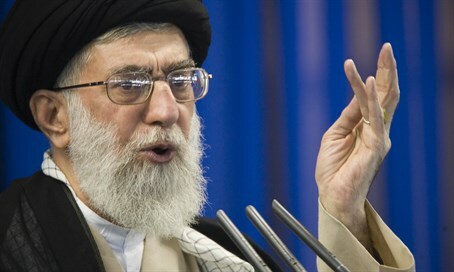 “This is enmity,” the Supreme Leader charged in his New Year speech, which was broadcast on Iranian state television. Obama on Saturday, in his annual video message marking the Persian New Year, said a landmark nuclear deal Iran reached with world powers last year makes it possible for Iran to rejoin the global economy, increase trade and investment, and create jobs and opportunities for Iranians to sell their goods around the world, according to AP. He also said there is no guarantee that the next U.S. administration will honor all the commitments made by Obama’s administration. While the economic sanctions that were imposed on Iran over its nuclear program have been lifted, new American sanctions were recently imposed on it over its continued ballistic missile tests which are in violation of UN resolutions. Republican lawmakers last week unveiled legislation that would require Obama to impose even stricter sanctions on every sector of Iran's economy that supports the country's ballistic missile program, saying the sanctions he announced in January were not enough. Iran has denied that its ballistic missile tests violate UN resolutions, and Khamenei dismissed the recent controversy over the tests on Sunday. Earlier this month, the country’s Revolutionary Guard test-fired two missiles emblazoned with the phrase “Israel must be wiped out” in Hebrew. “What an outcry they raised over our missile issue saying, why did you test fire? Why did you launch the military exercise,” Khamenei said, according to AP. The comments are not the first time that Khamenei has verbally attacked the United States and warned Iranians not to trust Americans. Earlier this month, the Supreme Leader ruled out his country having ties with the United States or “the Zionist regime” – that is, Israel – claiming he had proof that the United States was planning a coup in Iran. Last month, Khamenei claimed that the “global Zionism network” dictates the United States’ and many EU members' policies vis-a-vis Iran. The comments came one week after Khamenei blasted the United States for their support of “child killing” Israel. He has in the past referred to Israel as a “cancerous tumor” and also predicted several months ago that the Jewish state will not exist in 25 years.